Share this product and receive a $3.95 sharing discount. .925 Sterling Silver Dog Tag. 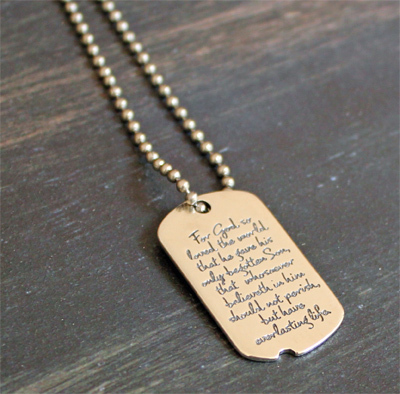 This dog tag necklace has been fashioned with sterling silver. It has been cast with the words from John 3:16. For God so loved the world that he gave his only begotton Son, that whosoever believeth in him should not perish, but have everlasting life. The other side has been cast with the the scripture reference John 3:16 and a simple cross. 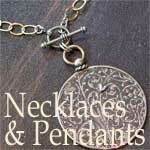 This sterling silver dog tag measures 1.5" and hangs on a 20" steel ball chain. It has been designed for men or women. This dogtag shape is a scaled down reproduction of the shape introduced by the US army in 1940. The notch was to enable the tag to be correctly aligned onto the embossing machine and the shape is now universally recognised. Made in the USA by dvbny.